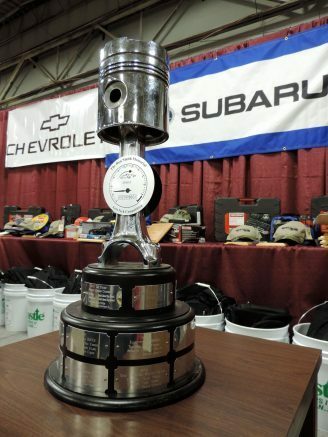 The Niagara Frontier Automobile Dealers Association and SUNY Erie will host the 2019 NFADA Ron Smith Memorial AutoTech Competition on Saturday, Jan. 19, at the SUNY Erie Vehicle Technology Training Center at 5885 Big Tree Road in Orchard Park. It will be open to the public beginning at 9 a.m. and concludes with an awards ceremony at approximately 3 p.m. The competition features teams of two high school automotive seniors who will go through a series of diagnostic, workstation and performance tests to measure their automotive technical skills and abilities. Ford Motor Company is the vehicle sponsor and will be providing six 2019 Ford Explorers for the students to compete on. In a separate event, high school juniors will compete against a stopwatch in an Olympic-style format to dismount and mount tires using Hunter Engineering tire-changing machines. Competitors in the 2019 competition represent the following career and technical high schools from the Western New York area: Burgard High School, Genesee Valley Educational Partnership, Harkness Career & Tech Center, Kenton Career & Tech Center, LoGuidice Educational Center, Niagara Career & Technical Center, Potter Career & Tech Center, and W.D. Ormsby Center. First place finishers will represent their school and the Niagara Frontier Automobile Dealers Association at the National Automotive Technology Competition in New York City in April. Follow the NFADA Ron Smith Memorial Autotech Competition on Facebook, and for more information on the Niagara Frontier Automobile Dealers Association, please visit www.nfada.com. The NFADA is a trade association with new vehicle dealership members from across Western and Central New York. The association provides products and services to its members including insurance products, safety and health programs, along with compliance products to help members save time and money. Be the first to comment on "High school students to compete in NFADA AutoTech competition"